A former National Security Adviser, Colonel Sambo Dasuki (rtd), 13 former governors and 7 ex- ministers have been barred from traveling under the Executive Order 6 (EO6) issued yesterday by President Muhammadu Buhari. Alotof Nierians has been waiting for a to-do list. 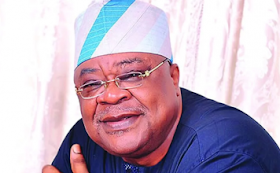 According to the Nation, they are: ex-governors Saminu Turaki (Jigawa), Murtala Nyako (Adamawa), Adebayo Alao-Akala (Oyo), Gabriel Suswam (Benue), Rasheed Ladoja (Oyo), Orji Uzor Kalu (Abia), Danjuma Goje (Gombe), Attahiru Bafarawa (Sokoto), Muazu Babangida Aliyu (Niger); Chimaroke Nnamani (Enugu); Sule Lamido (Jigawa); Gbenga Daniel (Ogun); and Ibrahim Shehu Shema (Katsina). National Publicity Secretary of Peoples Democratic Party (PDP), Olisa Metuh; Chief Jide Omokore; Ricky Tarfa; and Dele Belgore (SAN).